One of the real bonuses for India with having the IPL is it provides an opportunity for their 2nd tier bowlers and batsmen to test their skills against the best in the world. With a few notable exceptions, India have not had a reputation for producing quality fast bowling. In some ways the IPL is the perfect vehicle for this to change. With foreign coaches coming in, and high quality seamers in every team there is no excuse for Indian players to not develop their games. So it's interesting to see who has taken advantage of this. Who is getting better, and who is stagnating? And which bowlers are consistently providing world class performances? There's a mixed bag there. Some (like Ashish Nehra and Ashok Dinda) have been good at taking wickets, but have gone for a lot of runs. Others (like Zaheer Khan and particularly Praveen Kumar) have been economical, but have not taken many wickets. There can be arguments about which is the most important, but ideally a bowler will have a good economy rate and a good average. I feel that a quality player should average under 25 and have an economy rate of under 7.5. 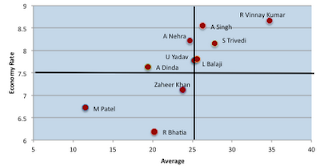 The graph shows 3 players making the grade (Patel, Bhatia, Zaheer), and one just missing out (Dinda). One player actually doesn't even fit on the graph at all: Praveen Kumar. 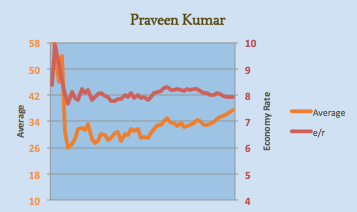 However, he is so far below the economy rate line that he is worth considering. So once I had isolated the best performers of the Indian quick bowlers, the next question was to look at each of them in detail, to see if they had been making the most of the opportunities that had been afforded to them through the IPL. 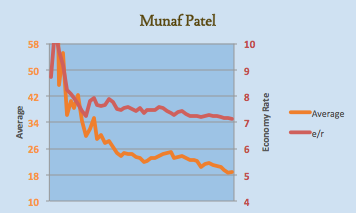 Munaf Patel has really been the stand out of the Indian quick bowlers. He has taken wickets, but without conceding many runs. And the chart shows that his numbers are getting better and better. It's difficult to change a career economy rate in 4 overs, but almost every game the career rate is decreasing. The rate of improvement suggests that there is still more to come from him also. Munaf Patel is shaping up as a bowler who could in the future genuinely look the likes of Malinga, Steyn and Broad in the eye. 10 wickets for 89 runs this IPL suggests that he possibly already can. 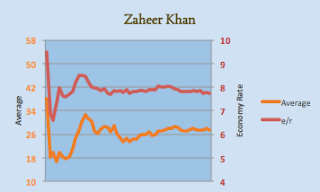 Zaheer has been a steady performer for a while now. He's become very consistent, partially because batsmen know the danger they are in when he is bowling, and so take less risks. He still takes a wicket roughly every 3 overs. He does not seem to have got much benefit from the IPL, but he was already a top bowler before the competition really got established. This name was new to me. There have not been many KKR matches on at times that are friendly for someone in my time-zone to watch, and his results never really stood out on the score sheets. 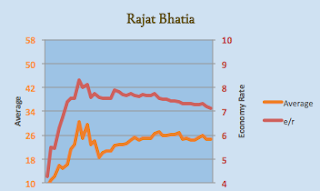 We can see that his results (particularly his economy rate) have been steadily improving. Combine this with some useful lower-order hitting in some non-IPL t20 matches (including 107* off 60 for Delhi against Railways), Bhatia looks like a very useful performer. 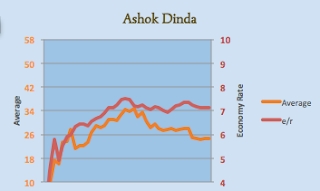 Ashok Dinda has done very well this season. He's taken his career average down from the mid 30's to the mid 20's and maintained an economy rate around 7 runs per over. He's managed to upstage his more illustrious colleagues Ashish Nehra, Angelo Mathews and Wayne Parnell, and in the process really establish himself as a very reliable contributor. He's gone at less than 6 an over so far this season, and if he keeps that up, an international recall may be on the cards. The graph clearly shows what is sometimes called 2nd year syndrome. A player has a good start, so everyone tries to figure out how to play them. The test of a great player is if they can come back from this and have a great third year. It seems to have taken a little longer than that for Dinda, but this year (his 5th in the IPL) is shaping up to be his best yet. Despite Praveen Kumar's average skyrocketing during the last 10 or so matches, he has continued to make it difficult for the batsmen to score. This whole article stemmed out of me researching to decide who to pick in my fantasy team, and despite what the numbers suggest, I actually went for Praveen Kumar. The reason is that it seems unlikely to me that a bowler can keep putting batsmen under pressure, and for that to continue to not result in wickets. Eventually someone is going to target him, and he'll either go for a lot of runs, or pick up their wicket. The interesting thing in this graph is the demonstration of how his game has changed. From a bowler who in one 10 match period averaged 20's but went for close to 8 an over, to a player who now averages a lot higher, but goes for less runs per over. Sometimes a bowler like that causes so much pressure that a wicket falls at the other end. Peter Siddle is a good example of a bowler who also does that. The bowler at the other end bowls a bad ball and it gets hit down a fielders throat. If I were an Indian selector, I would certainly take heart from the start of the IPL. Bhatia has to be coming into reckoning, as does Dinda, and once Varun Arron and RP Singh are back from injury, there could be a real surplus of talented quick bowlers for them to chose from. This is not a position that India has historically enjoyed very often. Munaf and Nehra always keep India guessing. Enjoyed the article. I agree that this is an excellent competition for measuring Indian quicks against each other, but given that the quick bowling tends to be moderately good in T20s and ODIs already and atrocious in tests this might send the wrong message to the selectors. What India really needs is more bowlers like Zaheer, very accurate and very fit. Players like Sharma and Munaf can come out strong early but tend to fade over long spells.